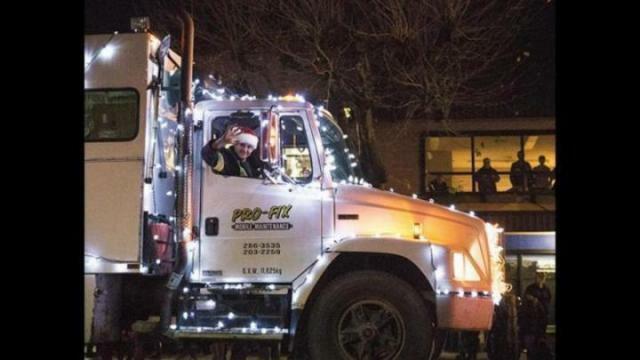 On Friday evening large trucks decked out for the holiday season took over Highway 19a between Rockland Road and Shoppers Row. Upland Ready-Mix decked out a cement truck for the annual Big Truck Parade in Campbell River on Friday evening. On Friday evening large trucks decked out for the holiday season took over Highway 19a between Rockland Road and Shoppers Row. Horns sounded and carols played to the delight of the audience. The rain held out until close to the end of the evening when people rushed back to Spirit Square for the chance to sit on Santa’s knee.